July 31, 2008 -- Please don't ask me the name of my favorite place to visit, nor my favorite hotel. I really, truly cannot answer. I've visited 136 countries and stayed in hundreds of hotels of every type and size. I've had tremendous service and indescribably bad service. Huge marble bathrooms with tubs you could swim in and bathrooms so disgusting that I peed and washed in the ocean. Meals I will never forget and many I would prefer to. It is rare, however, that I have had a hotel experience that was truly amazing. Rare that every moment of my stay was indelibly etched in memory. In the past five years, while writing this column, I have had only one such experience: My honeymoon stay at the Beverly Hills Hotel. Until a few weeks ago, it was my standard. But my wife and I found the true meaning of nirvana at what I will now name as the greatest hostelry in the world. You'll have to wait until the end of the column for the hotel's name, but I will tell you that the property is in Hong Kong. See if you can guess the hotel's identity before the big reveal. It started when we deplaned at Hong Kong International. At the end of the jetway, a uniformed young lady from the hotel was holding a board with our names on it. We then mounted a motorized cart and were driven to immigration, to baggage collection and to customs. At each stage, we were escorted through ahead of the masses. Slightly embarrassed, my wife and I resisted a royal wave as we whizzed through the crowds. Then we were ushered into a huge Mercedes for the drive to our hotel. The latest newspapers, cool towels and cold water were available on request from the driver. Our music choices and preferred temperature were all on call. Twenty minutes later, we arrived at the hotel. The manager (Hermes tie perfect), assistant manager, a bellman and doorman were waiting on the steps to greet us. We were escorted by this entourage through the lobby to the elevators and up to our accommodations. No front desk registering here. It was all done swiftly in our room. The luggage was only seconds behind. Is this arrival available for every guest? Yes, apparently it is fairly standard operating procedure--if you're smart enough to ask and let them know when you're arriving. The accommodations were, in a word, amazing. Every little trick or amenity I've found in other hotels around the world was incorporated into the room: a doorbell and do not disturb button; a hatch that opens to the corridor so your messages, newspapers and laundry can be placed discreetly without disturbing you. Every modern gadget to make geeks feel at home, including an intricate lighting system. (I think you have to be under 30 to successfully master it.) A box of office goodies for the non-geek: stapler; paper clips; rubber bands; and other accoutrements. A sensible minibar, with a special cabinet for an assortment of glasses, was discreetly incorporated into a dresser. And it continued: A proper desk and proper desk chair. Television, disc player and radio all sensibly worked off one--yes, just one--remote control. Enough closet space to make even my wife happy. In the bathroom, a toilet encased in frosted glass (a first for me). A clear-glass-enclosed shower stall with both a rainwater shower head and a handheld unit. Two his-and-her washbasins at opposite ends of the room. A massive his-and-her bathtub with view of Victoria Harbor. Huge tubes of Aqua di Palma shampoo, conditioner, body cream, bath gel. Innumerable six-ounce bars of soap. (We now have enough for a year.) Fluffy towels by the yard. The bed chamber? His-and-hers slippers and robes, of course. A good, hard mattress covered in very high-count linen. Telephones on each side of the bed. And much more. As for food and beverage, the hotel offered an amazingly good coffee shop with pastries that were works of art. The service was superb with a smile and instant recognition on each visit. A grill room with an open kitchen. A bar where single people can sit and eat while watching the chef do his thing. The best Dover sole this side of Wilton's in London. A sensibly priced and varied wine list. Fine china and glasses, as to be expected. Fabulous service, of course. On the top floor, a Cantonese eatery rated one of the best in the city nestled beside an over-the-top restaurant where no one who's not on the Forbes 400 list could ever afford. We are not on that list, so it went untested. Bars? One off the lobby and a small one, hidden away on the mezzanine, named in honor of Hong Kong's most famous artist. In both, the beer is served in a chilled sterling silver tankard. There is a spa that matches any I've ever seen. For the men, a wonderful, old-fashioned barbershop with hot towels, close shaves, haircuts and shoeshines. All in wood-paneled and leather splendor. I had a great haircut. For those who still smoke, there's a cigar bar. And more jewelry shops than Bond Street. All displayed the most amazing baubles for the wife--or, more probably, the mistress. Of course, a hotel cannot be deemed great just because it's got everything physically. It must have a heart and soul and that comes from its people. At this hotel, the staff seems happy. They exude confidence in their jobs and are immensely proud of their product, which, incidentally, emerged from a $150 million renovation two years ago. Nothing is done by rote. The head doorman has been there for 30 years, the chief concierge for 28 years. I've a feeling the new staffers will still be there in 30 years, too. To all who made our stay so comfortable, I salute you. It was the best $400+ a night I've ever spent on accommodations. And, in my modest opinion, it is the best hotel in the world: The Mandarin Oriental, Hong Kong. 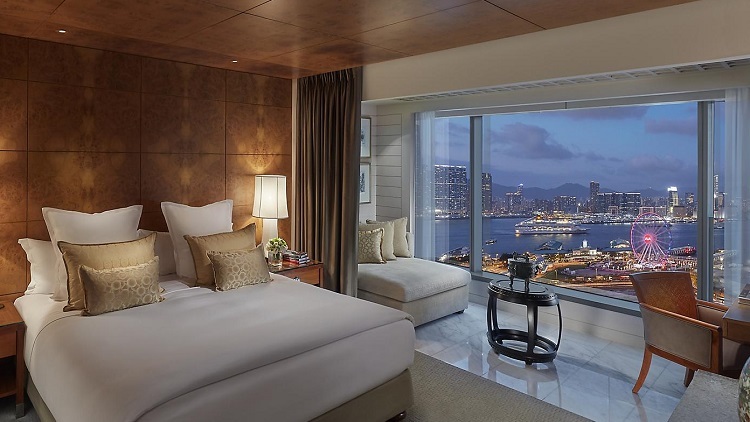 The Mandarin Oriental rates a 5.0 on TripAdvisor.com and is ranked as the Number 5 hotel in Hong Kong. Of more than 3,500 reviews, only around 100 rate the hotel less than four stars. All but 500 reviewers rate it five stars. -- J.B. This column is Copyright � 2008 by Michael Matthews. JoeSentMe.com is Copyright � 2019 by Joe Brancatelli. All rights reserved. All of the opinions and material in this column are the sole property and responsibility of Michael Matthews. This material may not be reproduced in any form without his express written permission.